In 1992, Tom Kalin made an assured debut with Swoon, a cornerstone in New Queer Cinema about the criminal lovers Leopold and Loeb, who kidnapped and killed a child in the 1920s. We’ve had to wait 15 years for the follow-up, which also refuses to pass judgment on a real-life, lurid crime: the murder of charismatic narcissist Barbara Baekeland (Moore) by her 25-year-old only child, Tony (Redmayne), great-grandson of plastics titan Leo Baekeland—and Mom’s occasional partner in sexual congress. Yet this oedipal docudrama, spanning 1946 to 1972, presents its scandalous material as a banal travelogue through eras and exotic resorts. Recapitulations of American decadence and decline often find their most felicitous expression in the oral biography; scriptwriter Howard A. Rodman adapted the excellent 1985 book of the same name, which assembles multiple first-person accounts like 1982’s Edie: An American Biography. 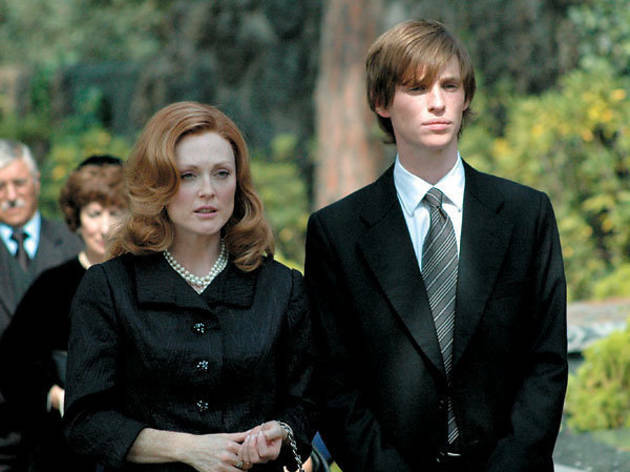 Although not as abysmal, Savage Grace shares some of the flaws found in Factory Girl. Just as Sienna Miller’s interpretation of Edie Sedgwick wobbled on a profound misunderstanding of a damaged, shimmering icon, so too does Moore’s portrayal of a borderline personality become pitched wildly off tone—as though Little Edie had gone into heat (odd coming from the same actor who brilliantly updated the woman’s melodrama in Safe and Far from Heaven). The ectomorphic Redmayne, for his part, uses his physique to convey the allure of the sexually fluid, regressed Tony, his alabaster skin under the Spanish sun a lure to both men and women. But burning plastic can release toxic fumes—as can movies about plastic heirs.